This 19th centruy building near Brussels, Belgium, used to be a mirror factory. 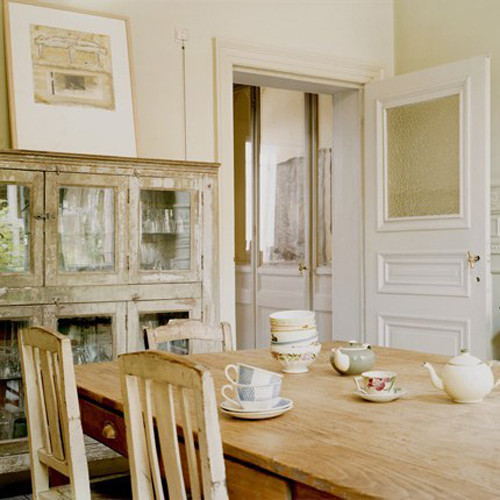 It was transformed into a beautiful guest house by owner Philippe ten years ago. With a lot of imagination and energy Philippe managed to turn the old factory into a warm and welcoming place. 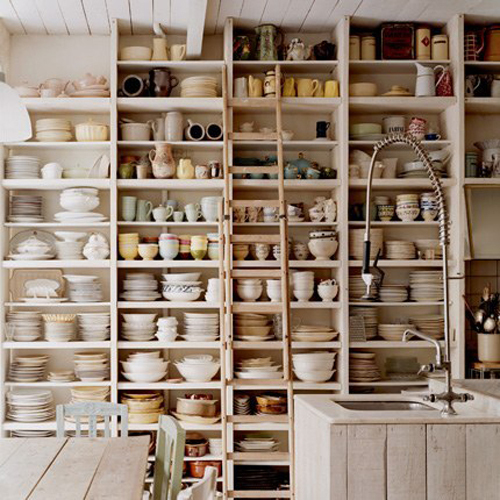 In the large dining room, which also serves as the kitchen, a huge collection of earthenware and glassware is being displayed on shelves rising to the ceiling. 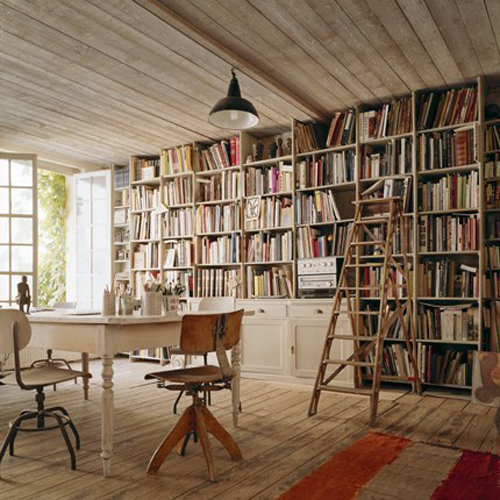 In his studio Philippe has built a huge library taking up the entire length of a wall. The gorgeous bath tub is a remake of a 1900 model. The guest room called “La Vie d’Artiste” (image above) lives up to its name. 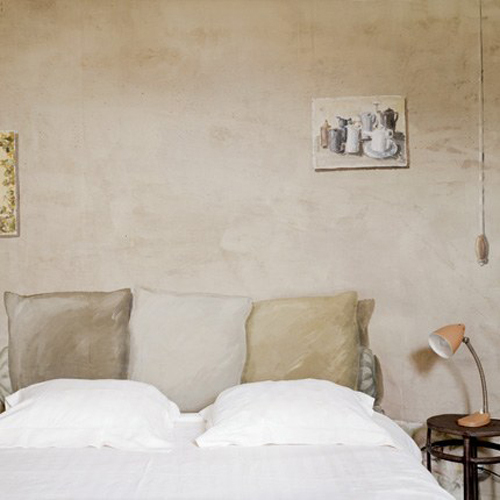 A large canvas painting of three large cushions resting on a pillow hangs on the wall and serves as a headboard. More information about this charming guest house can be found on on the website of Chambres en Ville. I just bookmarked this whole house, but what I really really really love is that claw-foot tub. I’ve been on the search for my dream claw tub and I just found it. Oh my! Books, pottery, china, bookshelves, shelves, clawfoot tub. Sigh! Beautiful! I’ve been reading for a while now. Officially one of my top five blogs. thanks for the pretty pictures. so pretty i want to eat them, put them in my mouth, swallow, digest and have the prettiness forever inside of me. Oh my goodness I want ALL their china and glass!!! the style from 1900 for bath tub is a good ideea! Thank you so much for all your kind comments! I am happy to hear that you enjoy reading my posts. You make my day! Be still my heart! 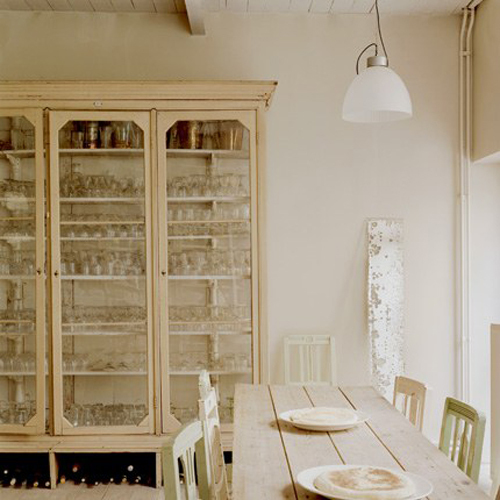 What a gorgeous dining room and cupboard! Beautiful.